Your little darling will have the most fun time or a restful, good night sleep without any irritations or interruptions! Comfort and security comes first. Our sheets for pack & play cribs has 150+ gsm thick fabric made of high quality cotton fibers that is combed to give the most soft and comfortable surface for your baby to sleep on. 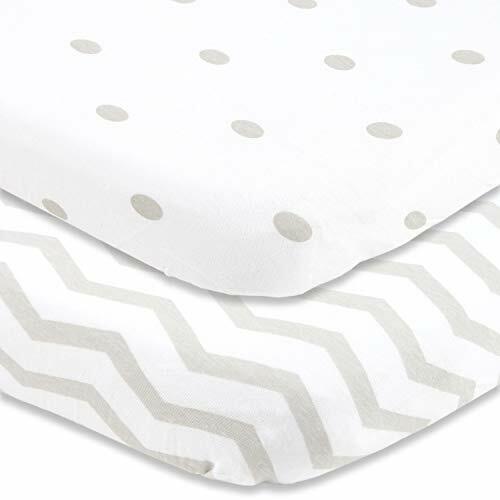 It's lightweight, hypoallergenic and breathable to be perfect sheet for your baby's sensitive skin. Our pack play sheets are better than graco pack n play sheets because they are knitted and more softer, just like your favorite T shirt and they give your baby the most needed comfort. Our pack in play sheets are stretchy and easily replace any mini crib sheets 24 x 38 x 3 for a more snug fit because of its deep pockets. Fits well on Graco, Dream on Me, Joovy, LA Baby mats. Are you ready to make the best choice for yourself as much as you do for your baby, and make your life simple? Most mini fitted crib sheets do not consider your needs as a parent. It's a pain when you buy a beautiful print and it fades after couple of washes and fabric starts pilling or worst the sheets shrink to not even fit anymore. But with our baby mini crib sheets, you don't have to worry about any of these problems, because we take pride in our manufacturing process and make sure they just don't happen. Moreover, its machine washable with clear instructions and a two pack gives you a peace of mind because you can always use the other one! Our cute and sturdy box packaging makes this mini crib bedding set an ideal gift for baby shower or any other occasion. Gives your baby utmost comfort, wonderful sleep, and to you a peace of mind for not worrying about pilling, shrinkage or fading... Or Your Money Back! If you're ready to put your little one to sleep on one of the softest sheets for pack and play that will also last for a long time, click ● Add To Cart Now! ● to find out what you've been missing! SUPER SOFT - Unlike other fabrics, 100% cotton jersey knit is not just soft but cozy and breathable, which ensures your baby is comfortable all the time. We use 150+ gsm fabric made from ring-spun cotton and an extra combing process to guarantee a very fine quality pack and play sheets for a good night sleep. UNIVERSAL FIT WITH EXTRA SAFETY - Our porta crib sheets has encased elastic band around the entire edge, which gives it a secure & snug fit and makes the covers safer for babies. All our sheets for pack and play mattress are designed to fit standard pack n play, portable crib and playard mattress. The 5 inch deep pocket prevents the baby bed sheets to come undone. DURABLE - our machine washable and easy to dry mini crib sheet gets softer with every wash. We know that isn't going to make the chore any easier! But the idea of clean, softer playpen sheets will make you look forward to washing and folding them. Our packnplay sheets are stretchy and strong to bear any minor adjustment in size of your pack & play mattress. FASHIONABLE PATTERNS WITH TIMELESS STYLE - The cute sheep and stripes in gray color offers the ideal bedding décor for your precious baby girl or boy. And our two pack option allows you to use one, and wash one, always having a sheet available for easy convenience. If you have any questions about this product by Cuddly Cubs, contact us by completing and submitting the form below. If you are looking for a specif part number, please include it with your message.